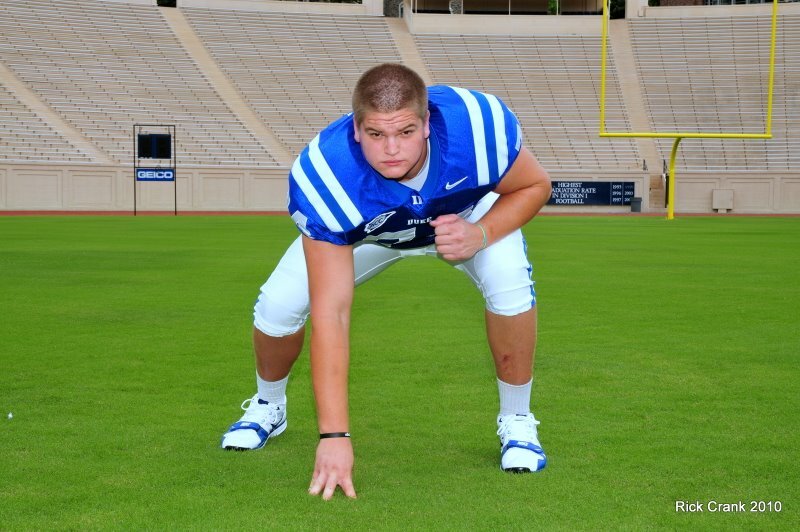 DURHAM - Redshirt freshman David Harding is enjoying his first season in the trenches as a Duke offensive lineman. BDN caught up with the future offensive line stalwart during todays weekly press conference. [private] The Duke Blue Devils continued their early assault on the class of 2009 getting a commitment from David Harding a 6-4, 280 pound offensive lineman. Harding plays tackle for Boone High School in Orlando, Florida. The Devils beat out Florida State, Vanderbilt and many others including South Carolina. There were unfounded rumors that Harding would commit to the Gamecocks this weekend floating around the Internet. Harding's decision gives the Blue Devils a total 22 commitments under first year Coach David Cutcliffe. It's quite obvious that many prospects can clearly see the direction in which the program aspires to go. 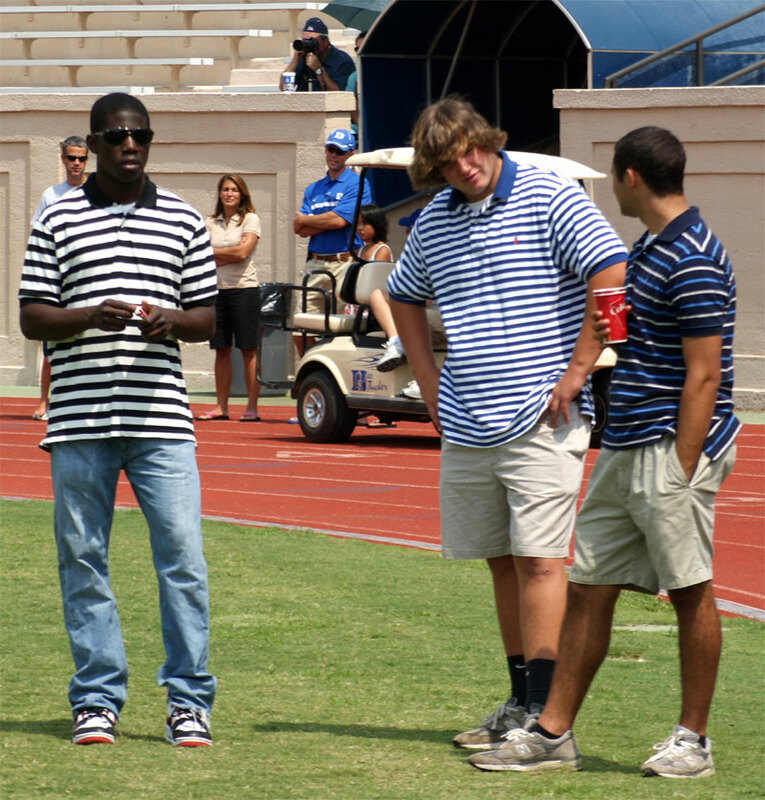 Harding was on campus to take in the "Meet the Devils," festivities and the scrimmage. Duke has very much turned their attention to the class of 2010, but still has a few spots to fill in the 2009 class. It's been a long time since Duke has committed so many prospects before their first snap in the coming season. The staff has been quite active on the recruiting front and it's clearly the "Dawn of a New Day," which is the slogan on this seasons team poster. DURHAM, N.C. -- Quarterback Thaddeus Lewis completed nine-of-11 passes for 131 yards and one touchdown and added another score on the ground to highlight Duke's 50-play controlled scrimmage on Tuesday afternoon at Wallace Wade Stadium. Lewis hooked up with Sheldon Bell for a 33-yard scoring strike to go along with his four-yard touchdown scamper. Tony Jackson paced the ground attack with 10 carries for 68 yards and one touchdown while Jay Hollingsworth scored on a three-yard run. “The big thing was to try and create some game management situations,” said head coach David Cutcliffe. “We came out and divided our squad up and had our starting units together. We put them down 10 points midway through the third quarter and tried to play a game from then on. Fortunately, we came back and won by 21. We were productive, but the biggest thing I wanted to accomplish was not to get anybody hurt so we did not tackle live. Bell had three receptions for 53 yards while Johnny Williams added three grabs for 50 yards.